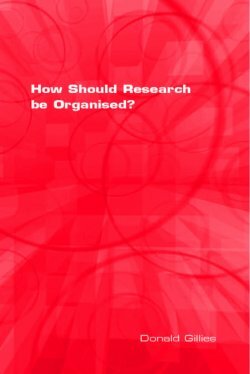 How Should Research be Organised? This book presents detailed criticisms of existing systems for organising research, and outlines a new approach based on different principles. Part 1 criticizes the research assessment exercise (RAE) which has been used in the UK from 1986 to 2008. It is argued that the RAE is both very costly, and likely to reduce the quality of research produced. The UK government has decided that, from 2009, the RAE should be replaced by a system based on metrics. In Part 2 this system is criticized and it is argued that it is certainly no better, and probably worse, than the RAE. In Part 3 of the book, the proposed alternative system is outlined, and it is argued that it would produce better quality research at a much lower cost than either the RAE or the system based on metrics. The arguments are illustrated by a variety of examples of excellent research, taken from different fields. These include Einstein's discovery of Special Relativity, Fleming's discovery of penicillin, Frege's introduction of modern mathematical logic, and Wittgenstein's work on his masterpiece: Philosophical Investigations. The Author: Donald Gillies is Professor in the Department of Science and Technology Studies, University College London.